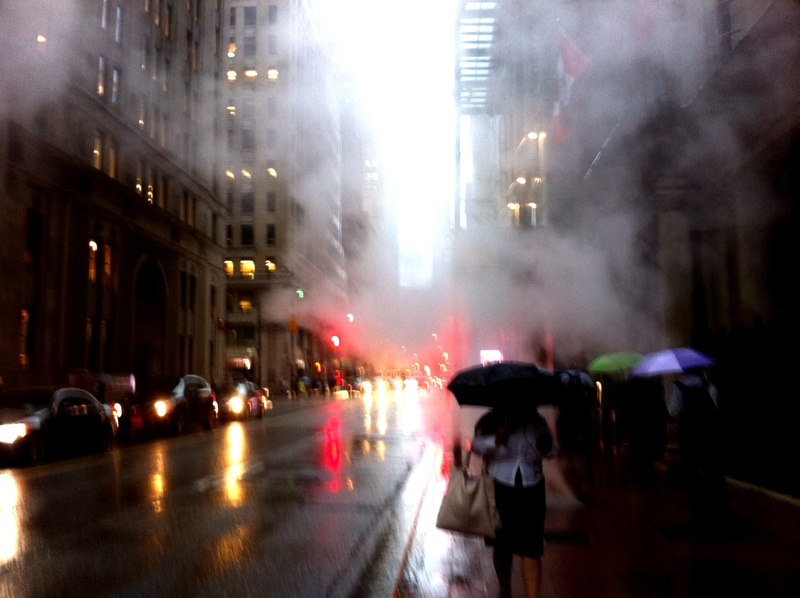 So we had a bit of rain tonight in Toronto. I thought I’d share a few pictures along my walk downtown, as waiting for a subway, bus or even taxi was pretty fruitless. 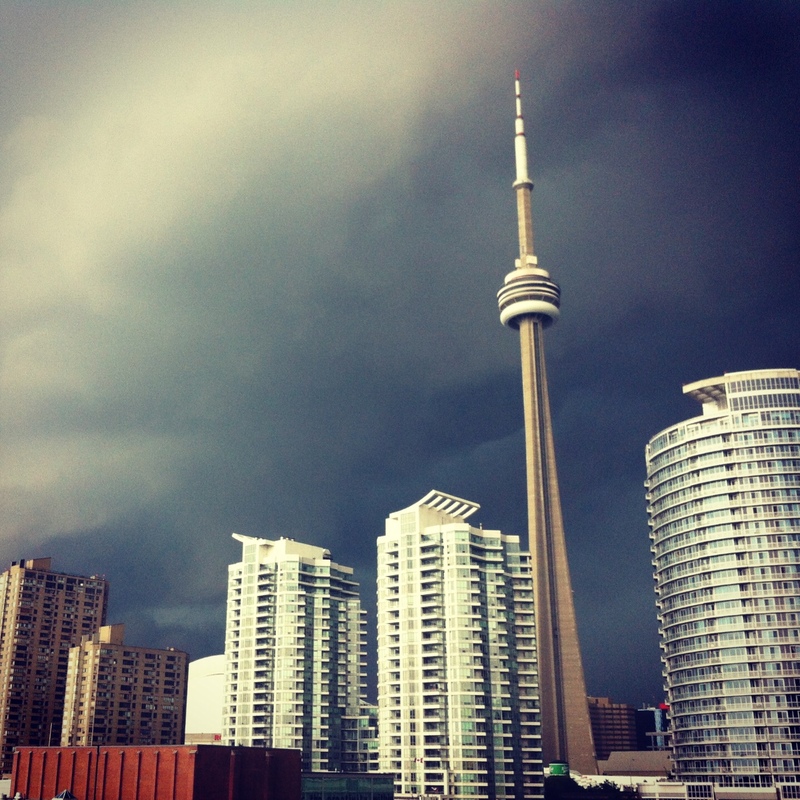 Before I go on, I want to thank everyone at the TTC, Police, Fire, EMS and any city officials helping to sort through the mess this storm caused in such a short period of time. Many people are angry, but there’s honestly only so much you can prepare for, and if you’re not, then do your best to pull through, which the city is doing. 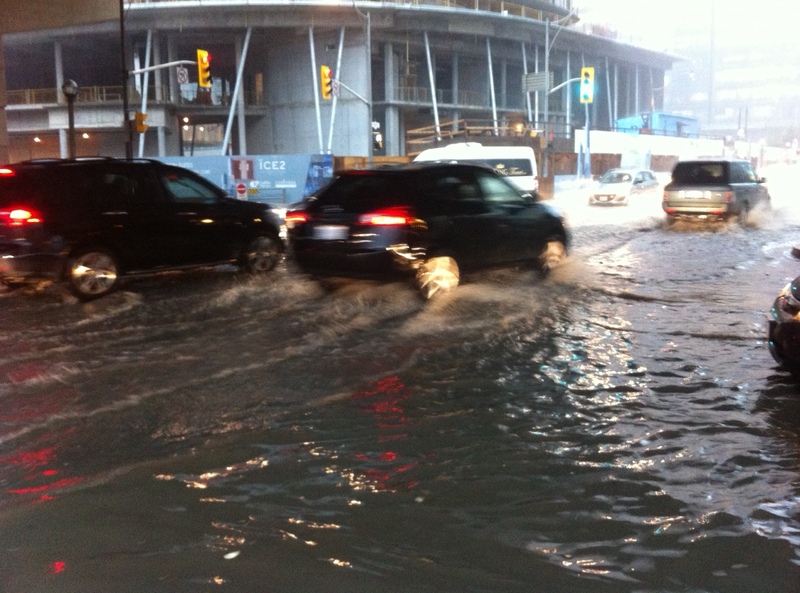 The water on York Street underneath the Gardiner Expressway was calf deep or higher and at this point I’d given up even trying to stay dry or else I wasn’t getting anywhere. The best thing to do was wait for the “tide” to roll away so I didn’t have to walk in as much water. 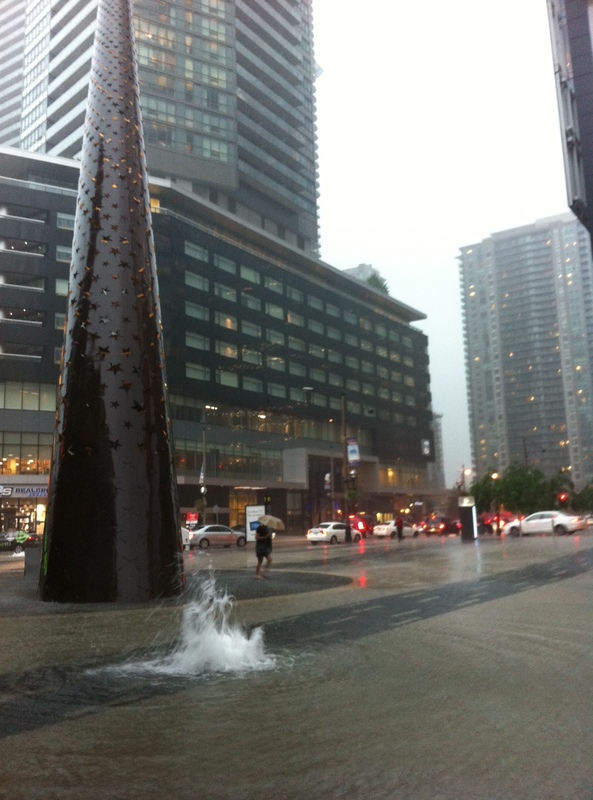 As I was rushing to Union Station, I completely missed the new fountain in Maple Leaf Square. There were two drains that were over flowing, causing the fountains you see above. 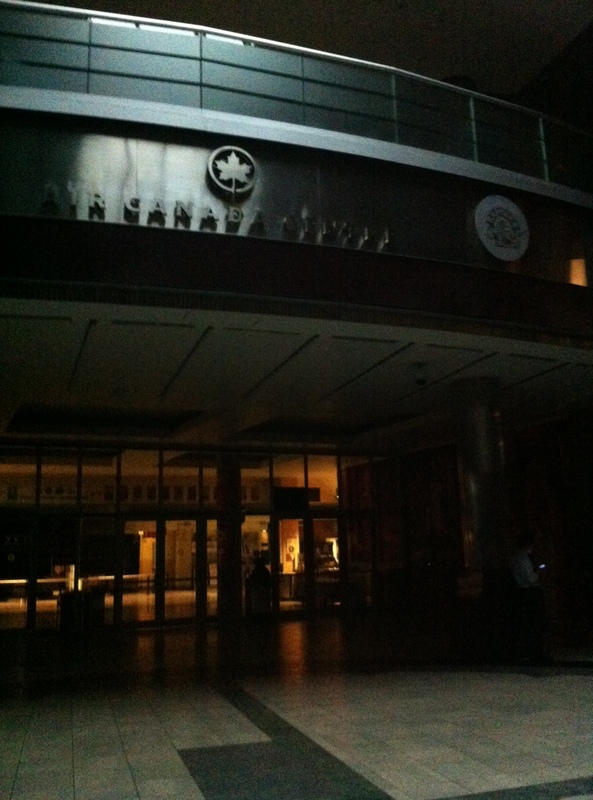 Yet another surprise was walking into the Air Canada Centre and not having any lights. It was here I came to the conclusion that I wasn’t getting home by subway. 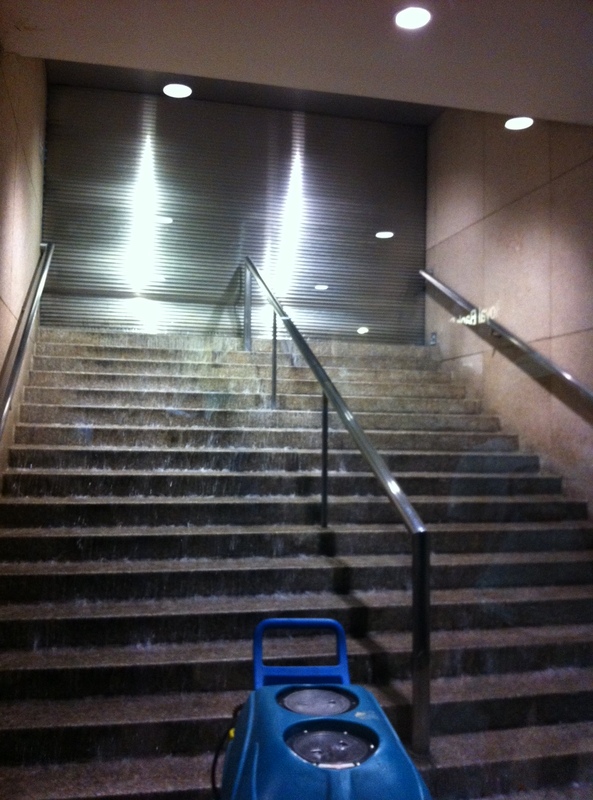 As I was looking for an exit out to Bay Street, I first heard a lot of water coming in down by the subway platform, so I took a look by the stairs and saw TTC employees squeegeeing a small waterfall of water onto track level – it’s understandable why no trains were running. Above you’ll see water streaming in from the street into the main level area of the station. Staff were working to block it off from entering the station, and shopvac’ing it where they could. After hanging outside the Royal York Hotel for a bit waiting for a manhole to explode (thankfully it didn’t), I made my way over to Bay Street to hopefully catch a shuttle bus. After waiting a while, I knew I wasn’t getting home any time soon so I started walking. Remember I had no umbrella or jacket. 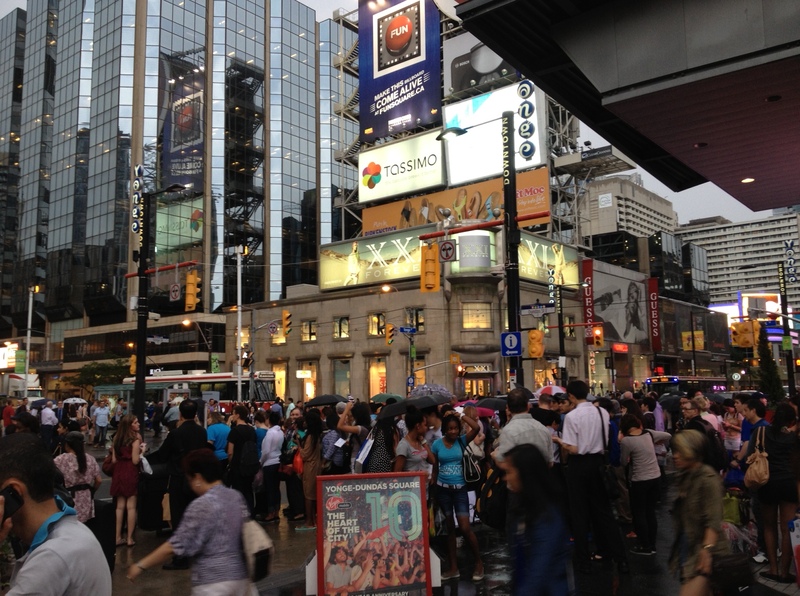 After a detour for food and a break from the rain in the Eaton Centre, I headed back out to Yonge-Dundas Square, where the rain had let up quite a bit, but obviously hoards of commuters were stranded and huddled waiting for the shuttles. Not me though. I kept walking. 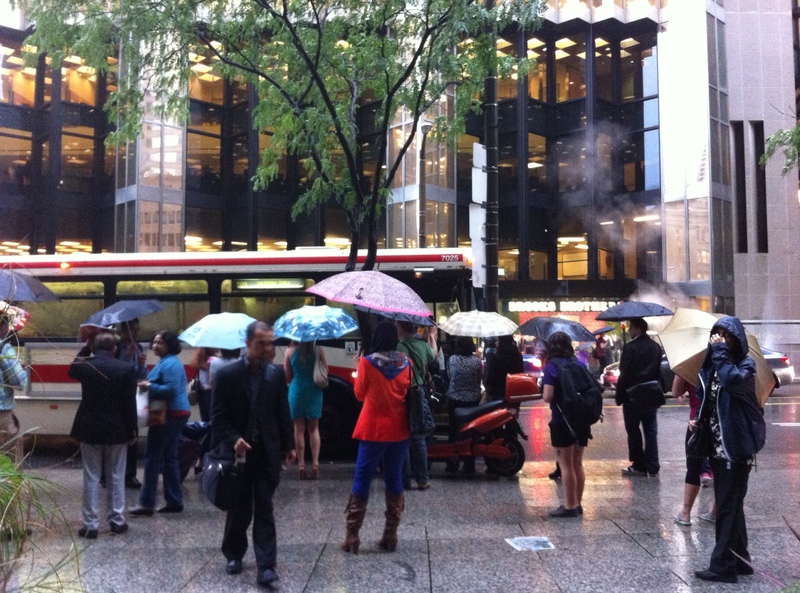 After that I was on a mission to make it to Yonge & Bloor, where the subway was working until Lawrence. Luckily I hopped on and eventually made it home to dry off and warm up. I know my trip wasn’t as crazy as some people, but remember in situations like these, it’s very easy to lose your cool at people who are trying to help you. You just need to realize that everyone is having a bad day, and you don’t need to make another person’s that much worse.